As part of the marketing plan to launch the Flowers In The Dirt remaster, some unheard tracks have been published on paulmccartney.com as free download. 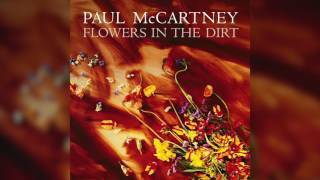 To celebrate the forthcoming reissue of Paul’s 1989 Flowers In The Dirt album an exclusive demo of the album track ‘This One’ has been made available for download on PaulMcCartney.com. The reissue has received rave reviews with many focussed on how great and timeless the acoustic demos sound… But what the story has yet not really touched on is that Flowers In The Dirt wasn’t the first time the public heard the results of these songwriting sessions! The Deluxe Edition reissue of Flowers In The Dirt includes a 112-page essay book telling how Paul and Elvis first started writing together back in 1987, two years before the album’s release. Indeed, the very first time the public heard anything from their collaboration was on the lesser known tune, ‘Back On My Feet’, which featured as the B-side for Paul’s 1987 single ‘Once Upon A Long Ago’, a release promoting his ‘All The Best!’ compilation. And today, to bring the story full circle, we’re pleased to announce the first play of the demo for ‘Back On My Feet’. The song – a co-write between Paul and Elvis – tells the story of a man down on his luck, but ending on a hopeful note: “Give me your hand, til I’m back on my feet”.